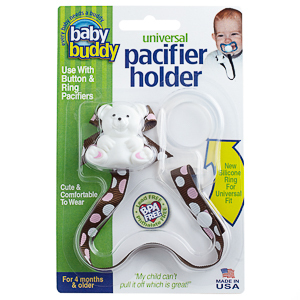 Our NEW Universal Pacifier Holder works with all pacifiers! Still handmade in the USA, our Baby Buddy pacifier holder still features our cute bear design and strong grip clip, but now are also available in 26 new fashion ribbon patterns! Use with button or ring pacifiers using either snaps or the NEW Silicone Adapter Ring. 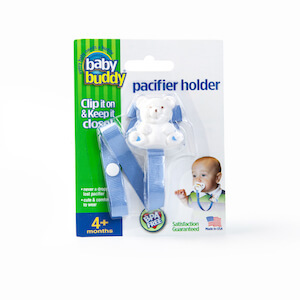 Buddy Bear helps to keep baby’s pacifier within reach and off the floor.